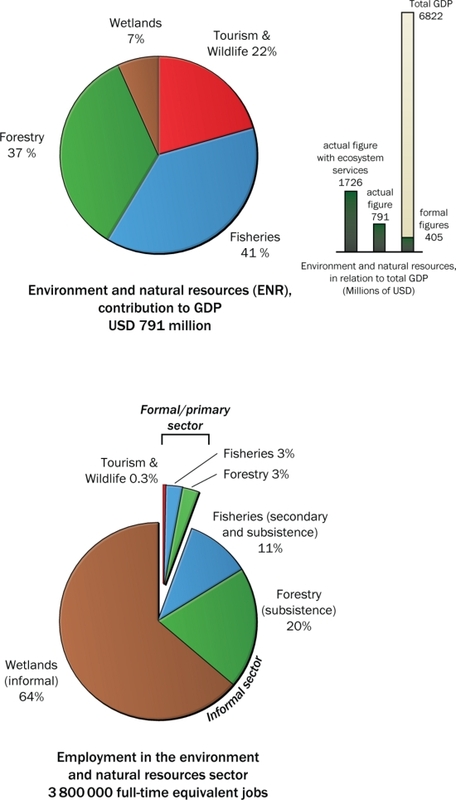 Estimations calculate that the environment and natural resources sector should contribute USD 791 million to the Uganda GDP, excluding benefits like ecosystem services. In the formal figures, only USD 405 million is recorded, where subsistence use and informal markets are not captured. Over 90% of the employment in the sector is secondary processing and subsistence use. Sustainable natural resource use implies that this sector will continue to provide a vital non-agricultural rural employment for the poor. Conversely, unsustainable use will eliminate jobs from this sector.